Join us at Roger Dean Chevrolet Stadium on Saturday, August 18th, for a 1pm start as we support two important organizations that make a difference in our local community, Quantum House and the American Cancer Society of Southeast Florida. 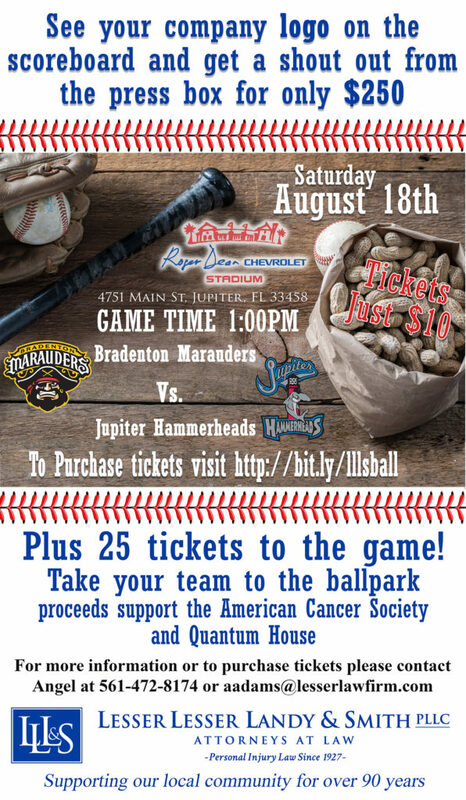 The Firm is hosting the baseball game between the Bradenton Marauders and the Jupiter Hammerheads, with all proceeds from ticket sales going back to the charities. There will be kids’ activities, games, and prizes. This event will be fun for the whole family! Tickets are only $10 with the proceeds going to American Cancer Society of Southeast Florida and Quantum House. Do you own a business? We have a special deal for your company!! !